Our Daily Deal today is a timeless classic for any room. Refresh, renew your decor simply and effectively with this gorgeous pedestal bowl - certain to become a talking point among guests. For today only we've reduced the price by 45%, and only while stocks last. Simply click below for more information and to purchase. 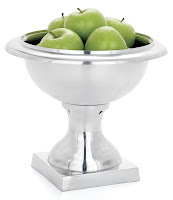 A striking addition to any room, this aluminum pedestal bowl is perfect for an entrance, window, hearth or table. Filled with ornaments, fruit, seasonal decorations or even left empty, this is an impressive piece. Hand polished inside and out, it represents a modern take on traditional design.